We report an unusual case with clinical signs of a parietal bony defect and bulging. A 9-month-old boy with right parietal bulging presented to the emergency department. Before neurosurgery consultation, the emergency physician suggested a leptomeningeal cyst due to head trauma. However, the boy had no previous definitive head trauma history but had an accompanying increased head circumference (47 cm, 90 th percentile), motor delay within 1.5 months and rapid onset of epileptic seizures 2 weeks previously. Cranial computerized tomography (CT) scans showed a cranial bony defect in his right parietal bone [Figure 1]. Magnetic resonance imaging (MRI) showed that the tumor was characterized by a cystic mass with a central homogeneous solid component enhancing with gadolinium attached to the dura, leading to a large effect on the ventricles in the temporoparietal region [Figure 2]. Antiepileptic treatment was commenced for seizure prevention. A frontotemporal craniotomy was performed. A mass was observed to be attached to the dura. The solid component of the tumor was solid, vascularized and barely distinguished from normal glial tissue. The cystic part of the tumor was aspirated. The postoperative period was uneventful. Total removal of the tumor was documented on a control MRI. Because there was subdural hygroma formation squeezing the brain tissue on CT scan on the third day of the postoperative period, a subdural-peritoneal shunt was inserted. His 6-month follow-up revealed no identifiable pathology. 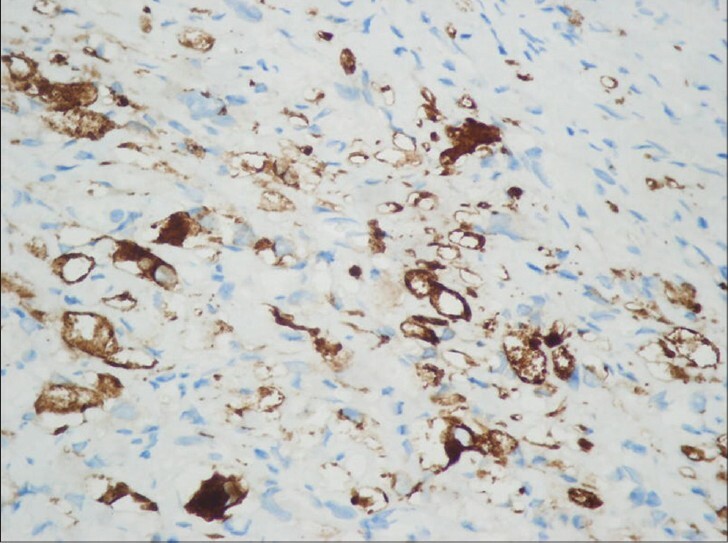 The histological examination revealed a mixed glial-neuronal tumor presenting with a nodular pattern involving the cerebral cortex and subcortex. Astrocyte-like cells had large, round and vesicular nuclei with surrounding large amphiphilic cytoplasm. Neuronal cells had vesicular chromatin and polygonal nuclei with large perikarya. A few multinucleate cells were observed. 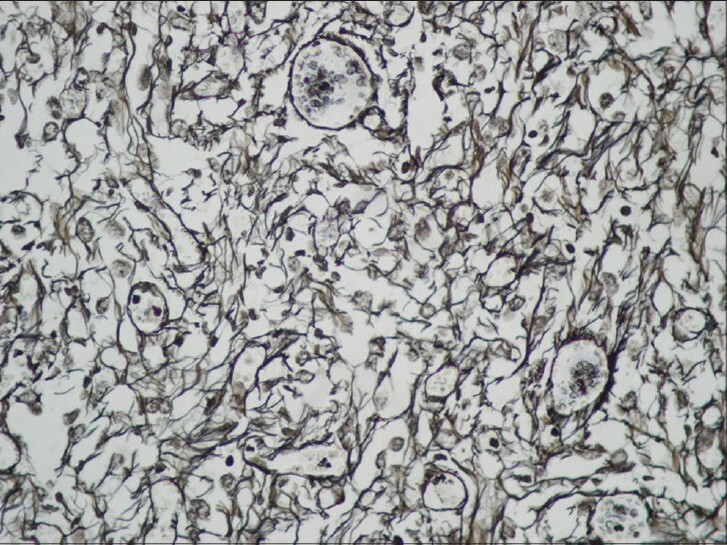 The cells were surrounded by diffuse reticulin and collagen fibers. There was only atypia, with no mitotic figures, necrosis or vesicular euchromatic nuclei (VEP). Vasogenic edema was present around the neural tissue, with non-gemistocytic gliosis. The conventional histochemical stains Massontrichome (MTC) and Gomori'sreticulin stain were used to stain interstitial collagen fibers and reticulin fibers, respectively [Figure 3]. 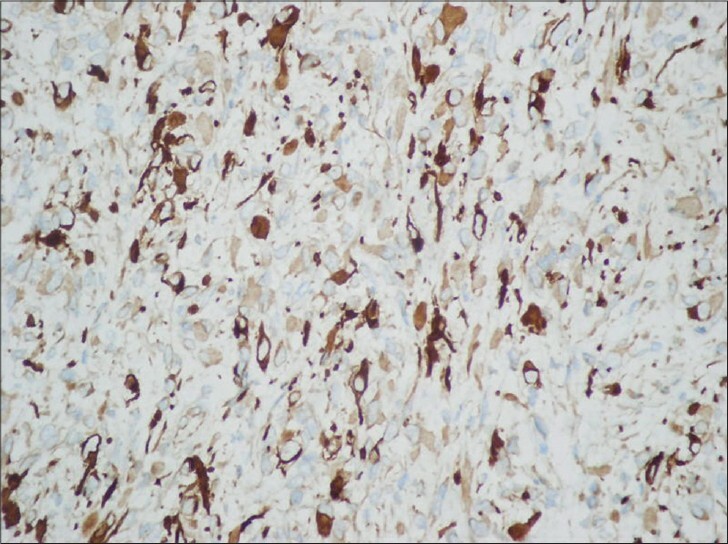 Tumor cells were immunohistochemically stained for glial fibrillary acidic protein (GFAP) [Figure 4], synaptophysin [Figure 5] and [Figure 6], chromogranin, S-100 and epithelial membrane antigen (EMA), and they were negative for CD34, NFP and progesterone. 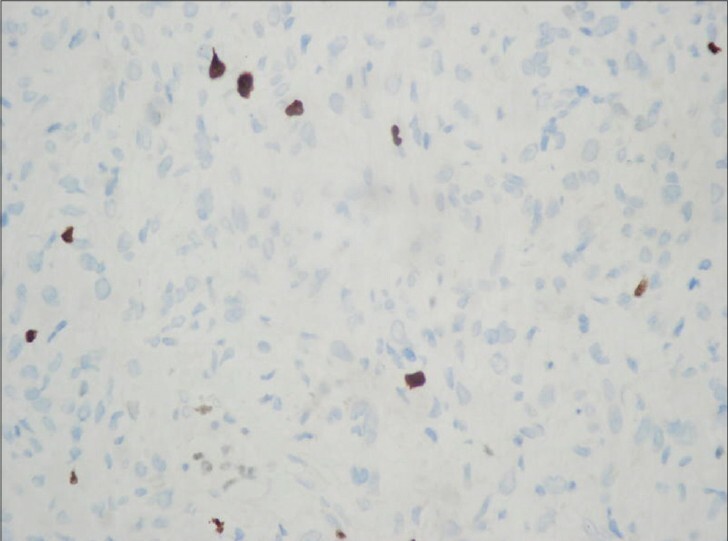 Nearly 2% of tumor cells were labeled with Ki-67/MIB-1[Figure 7], and approximately 1/3-2/3 of cells showed moderate nuclear staining for p53. The diagnosis was desmoplastic infantile ganglioglioma grade I (WHO, 2007). Desmoplastic infantile gangliogliomas are rare cerebral tumors classified as WHO grade I, with an indolent prognosis. They present within the first 18 months of life and have a male predominance. There are a few cases in the literature regarding CSF dissemination and malignant transformation. ,,, DIGs are well documented to show the presence of numerous mitoses accompanied by increased MIB-1 indices and the presence of necrotic foci. Thus, CSF examination is recommended in every patient with deeply located and subtotally resected DIGs. Patients can also present to a physician with complaints that appear over time, such as macrocrania and swelling over the fontanel. Some cases of bone abnormalities adjacent to a tumor have been reported in the literature. , However, thinning of the cranial bones or defects of the bones as a result of elevation of the intracranial pressure is not a common sign. Only one of six cases had a skull deformation in a study by Guillaume. In our case, the patient was referred to a physician because of swelling under the skin. It was found that the bone tissue adjacent to the tumor was almost eroded, and the overlying dura was herniated into the skin. Although DIGs are considered to be benign tumors, deeply located DIGs present aggressive behavior. The best choice of treatment is complete surgical resection. The use of adjuvant therapy is still controversial, particularly in incompletely resected tumors. However, these tumors are common at a young age; therefore, in partially resected cases, only neuroimaging is recommended for follow-up. There may be a need for adjuvant chemotherapy in deep-seated tumors with malignant histological features. In conclusion, a cranial defect is not a common clinical finding of DIGs. A progressive increase in intracranial pressure might lead to head circumference enlargement accompanied by a cranial defect and bulging of the dura over the tumor. Therefore, DIG should be considered among differential diagnoses when there are any signs or symptoms reflecting cranial bone defects. 1. VandenBerg SR, May EE, Rubinstein LJ, Herman MM, Perentes E, Vinores SA, et al. Desmoplastic supratentorial neuroepithelial tumors of infancy with divergent differentiation potential ("desmoplastic infantile gangliogliomas"). Report on 11 cases of a distinctive embryonal tumor with favorable prognosis. J Neurosurg 1987;66:58-71. 2. Darwish B, Arbuckle S, Kellie S, Besser M, Chaseling R.Desmoplastic infantile ganglioglioma/astrocytoma with cerebrospinal metastasis. J Clin Neurosci 2007;14:498-501. 3. Mallucci C, Lellouch-Tubiana A, Salazar C, Cinalli G, Renier D, Sainte-Rose C, et al. The management of desmoplastic neuroepithelial tumours in childhood. Childs Nerv Syst 2000;16:8-14. 4. Trehan G, Bruge H, Vinchon M, Khalil C, Ruchoux MM, Dhellemmes P, et al. 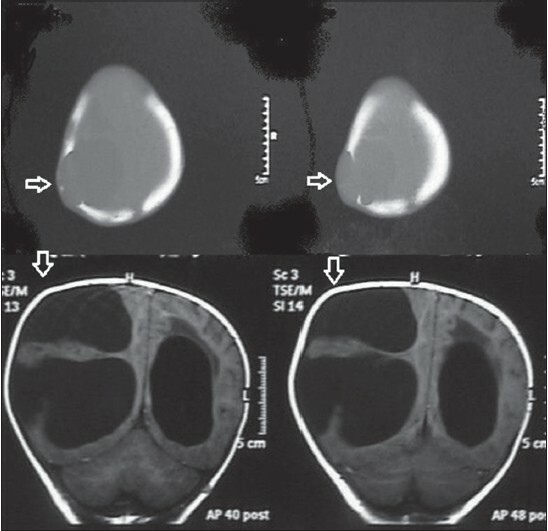 MR imaging in the diagnosis of desmoplastic infantile tumor: Retrospective study of six cases. AJNR Am J Neuroradiol 2004;25:1028-33. 5. Qaddoumi I, Ceppa EP, Mansour A, Sughayer MA, Tihan T.Desmoplastic noninfantile ganglioglioma: Report of a case. Pediatr Dev Pathol 2006;9:462-7. 6. Balasubramanian D, Ramesh VG, Deiveegan K, Ghosh M, Mallikarjuna VS, Annapoorneswari TP, et al. Desmoplastic infantile ganglioglioma: A case report. Neurol India 2004;52:384-6. 7. 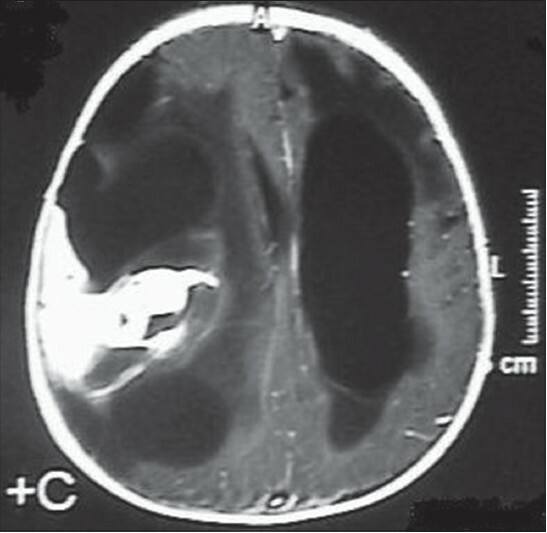 Geramizadeh B, Kamgarpour A, Moradi A.Desmoplastic infantile ganglioglioma: Report of a case and review of the literature. J Pediatr Neurosci 2010;5:42-4. 8. Fadare O, Mariappan MR, Hileeto D, Zieske AW, Kim JH, Ocal IT.Desmoplastic ýnfantile ganglioglioma: Cytologic findings and differential diagnosis on aspiration material. Cytojournal 2005;2:1. 9. Al-Sarraj ST, Bridges LR. 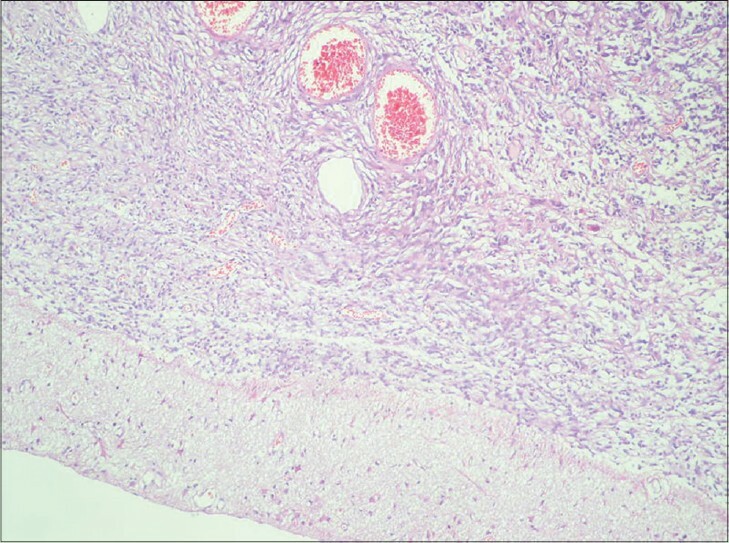 Desmoplastic cerebral glioblastoma of infancy. Br J Neurosurg 1996;10:215-9.